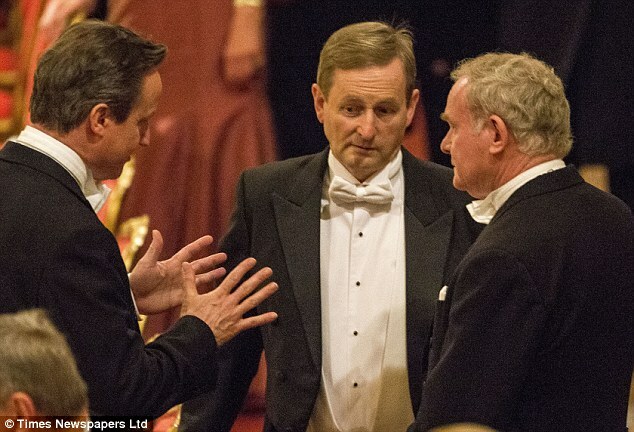 Did Martin McGuinness Pull The Wool Over Marian Finucane’s Eyes? 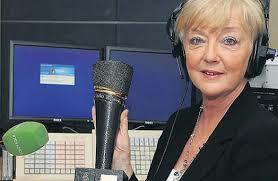 On Saturday May 31st, one of Ireland’s most celebrated broadcasters, Marian Finucane conducted a lengthy, near hour-long interview with the North’s deputy First Minister and former IRA Chief of Staff, Martin McGuinness on her RTE radio show. During the interview Martin McGuinness distanced himself from the IRA’s practice of ‘disappearing’ people it had killed and, as significantly, from the people who are most closely associated with it. In what has to be one of the strongest condemnations of the policy by a member of the Provisionals, he called the practice “shameful”, “absolutely terrible” and “awful” and said he was “horrified” when it once happened in Derry. In his interview McGuinness cited his opposition to the disappearance of a man from Derry in the early 1970’s who had been accused by the IRA of informing and shot dead. He claimed that his opposition, voiced to local leaders, led to the man’s remains being exhumed and returned to his family. But was the former IRA chief telling the truth about his role in this case and if not, how genuine then was his expression of distaste for the policy of ‘disappearing’ people to Marian Finucane? Below, former Derry IRA activist and prisoner Thomas ‘Dixie’ Elliott, who shared a prison cell with Bobby Sands, examines the evidence. First, here is the transcript of the part of the Marian Finucane interview that deals with Martin McGuinness’ views on ‘disappearing’ people and his experience of a victim of the IRA policy in Derry. The full interview can be heard here. MF – Can I ask you a question? Why did the IRA decide to disappear people after they’d been shot? MMcG – Yea, Terrible. Absolutely terrible. And very, very wrong in my opinion. It was awful and I suppose in the context of what was a very bitter conflict where terrible things were happening on all sides this was one of the worst things that ever happened. MF – Can you give us an insight into discussions that might have happened about that? MMcG – Well, I wasn’t involved in any of those discussions at all. What I was involved in…. MF – Presumably you noticed it, presumably you knew, you knew…..I’m not asking you to name people or anything like that because…..but you knew people who were involved in the policy decision. MMcG – No, I didn’t know people who were involved in the policy decision except to say when I became aware that this was happening I was very much of a view that everything possible should be done by republicans, and we’ve issued countless appeals to republicans who were involved in these scenarios to bring forward information. With considerable success. But there are still outstanding cases to be resolved. MF – I appreciate that and I know how difficult it is for the families and all of that, very much so. But I thought that if somebody was a tout and they were going to be shot, that they would be shot and they would be left there as an example. What thinking came round to disappearing people? MMcG – Well, only the people who took the decision can answer that question. I mean I remember, I remember, I remember being in Portlaoise prison in 1974 I think it was, and a man from Derry had been shot and the story was that he had been disappeared and had been buried somewhere or wherever and I was absolutely furious about it and it was actually when I got out of prison I met with local republicans and voiced my opposition and criticism of what happened and very soon afterwards that man’s body was returned. 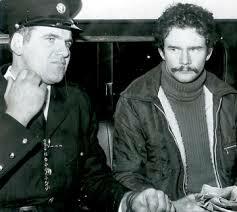 Martin McGuinness in Garda custody, circa 1972. But he was a free man when Patrick Duffy was ‘disappeared’. MF – And what did they say to you when you said to them this is a new low or whatever language you would use, I don’t know? What was the argument back? That’s what I can’t figure out. MMcG – Well as far as I was concerned they had no argument…. MF – But they had one. What was it? MMcG – I think it was more, I think it was more to do with whatever the person was alleged to have been involved in, whatever accusation had been made against and for me there was no rationale, it was absolutely unforgivable that those families have been subjected to the terrible trauma that they have been subjected to by republicans over those years. MF – But what I am trying to do….because you must have heard arguments. You knew, if you didn’t know the specific people, you knew people who had been olved like you say, you spoke to republicans in Derry. What, what were the arguments? MMcG – Well the arguments that they made to me was that the person in this particular case was someone from the local area and from their perspective they thought at a time when they were in conflict with the British, that it wasn’t from their perspective that they wanted to be publicly associated with, and that was the public execution of people who were from their own community who had been in the employ or agents for the British….I don’t accept that argument and I said so at the time. MF – Because they felt it would alienate people from them? MMcG – I think it was more because they wanted the focus to be more on the conflict between the IRA and the British Army and British state forces as opposed to civilians. But that’s only my assessment of what was said to me in that particular incident at that time. It wasn’t something that I wanted, I argued against it and to be quite honest I was horrified when I heard that this had happened and argued, well I think I argued to a point where I convinced people that they should remedy the situation. MF – Because….it’s just something that has gone around in my head, why people would do it and you must have heard discussions about it even if it was just discussions criticising it? MMcG – Well, I was very, very critical of it and I think the example that I gave about the situation in Derry probably could be applied to other areas. I don’t think it is an argument that holds up. I think that the way in which these families were treated…was absolutely wrong and republicans have to hold their hands up in accepting one of the most shameful situations that occurred during the course of something like 25 years of conflict. The case Martin McGuinness referred to was that of Patrick Duffy, a 37 year old father of seven children, from Derry’s Creggan estate, who was taken from a bar in Buncrana, County Donegal on the 9th August 1973 and shot dead as an informer. His body was then secretly buried in a bog, something which not only caused outrage among the public, politicians and the clergy in Derry but also local Republicans who were interned in Long Kesh. These Republicans believed that although he had been executed as an informer his family had every right to bury his body with dignity and not allowing that was anathema to the principles of Republicanism. Patrick Duffy was disappeared, not in 1974, as McGuinness claimed but on the 9th August 1973 when McGuinness was free but on the run in the South. He had served a 6 month sentence in Portlaoise jail earlier in 1973 after he and another member of the IRA were arrested after abandoning a red Cortina containing explosives and ammunition in the South on New Year’s Eve 1972 but he was released on the 16th May 1973, three months or so before Patrick Duffy was killed and disappeared. He didn’t see the inside of a prison cell again until 11th February 1974 when he was sentenced to 12 months for membership of a proscribed organisation and three months concurrent for withholding information, again in Portlaoise jail. That was six months or more after Patrick Duffy was killed. His claim to Marian Finucane that he was in jail at the time of Duffy’s disappearance is therefore simply unsupported by the verifiable facts. Far from being inside a prison cell at the time of Patrick Duffy’s killing and disappearance, Martin McGuinness was actually on the run and living in his grandmother’s house in Illies outside Buncrana, Co. Donegal. It was there that he received a note carried by the wife of one of the republican internees from Derry informing him that if the body wasn’t returned to the family then they would condemn Duffy’s disappearance publicly, an act that would cause huge embarrassment and discomfort to the Derry IRA leadership. The name of the internee’s wife and the nature of her mission to Martin McGuinness is well known to Derry’s republican community. 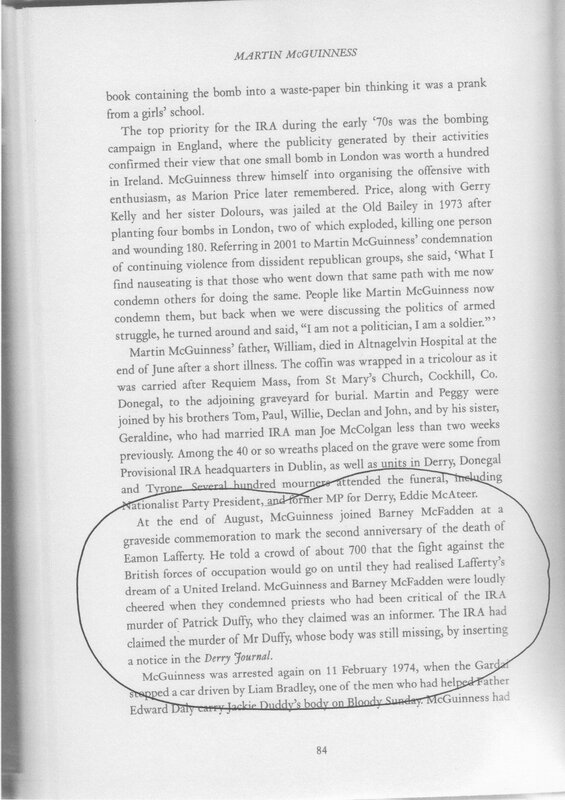 And far from being inside a prison cell at this time of Patrick Duffy’s death, McGuinness actually showed up on the streets of Derry just nine days after the alleged informer’s death and burial in a secret grave and shared a platform with another republican who condemned clerical criticism of Duffy’s killing and disappearance. 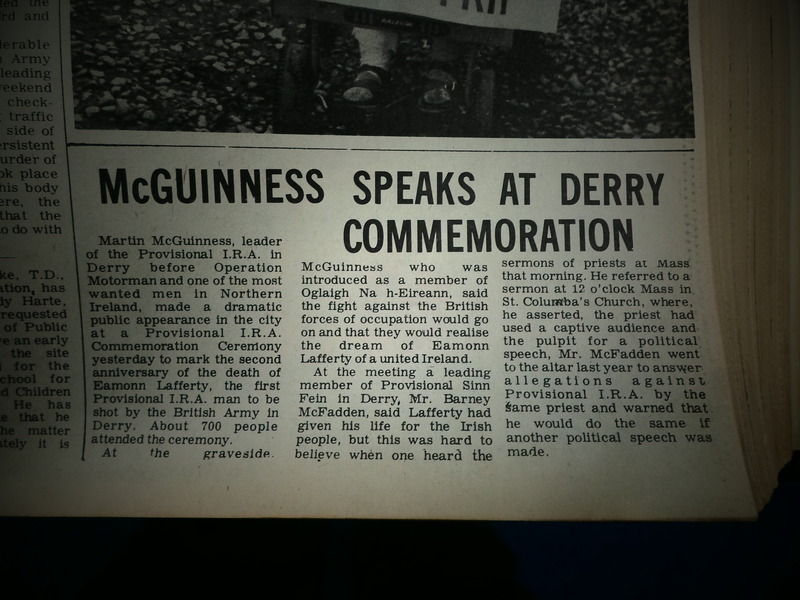 According to the Derry Journal, 21st August 1973, Martin McGuinness ‘made a dramatic public appearance’ at a Provisional IRA commemoration ceremony on the 18th August to mark the 2nd Anniversary of the death of Volunteer Eamonn Lafferty. About 700 Republicans attended the ceremony at which McGuinness spoke before Barney McFadden, a leading member of Derry Sinn Fein, who condemned local priests who had called for the return of the body at Mass that morning. The priest’s condemnation and that of politicians was carried on the same page of the Journal. The threat from Long Kesh worked. Patrick Duffy’s body was dug up and left in a brand new coffin inside a car which was abandoned on the Buncrana Road on the Northern side of the border on the 24th August, 1973. It was the pressure from Derry Republicans who were interned which eventually brought about the return of the body and not, as Martin McGuinness claimed to Marian Finucane, his insistence to the IRA in Derry that they should “remedy” the situation. Martin McGuinness told two lies to Marian Finucane. One was that he was in jail, well away from the scene of the crime, when Patrick Duffy was shot and buried in a Donegal bog. The second was that he had intervened and secured Patrick Duffy’s return to his family because of his abhorrence and anger at the dead man’s disappearance. Not true. It was the fear of IRA internees turning against the Derry IRA leadership which achieved that. If Martin McGuinness misled Marian Finucane about what really happened in the Patrick Duffy case then how can anyone believe that his condemnation of the IRA policy of disappearing people is at all genuine? Once more, we see a leading member of Sinn Fein rewriting history in order to distance himself from his own past and to lay the blame on those who merely took orders. The blatant lies like the one above are proof that if the contents of the Boston Project are destroyed and lost forever then future generations will not be able to learn from the mistakes and indeed the wrongs of the past. Only the truth will convince those coming behind us, in particular future Republicans, that war is dirty, it wastes lives and when so called leadership figures decide that a change of direction better suits their interests then it is the people fighting the war who go to the wall and not those leading from a safe distance. Good story – though the points raised don’t necessarily contradict Marty’s (substantive) claim that he was against the disappearing of the victim – points though that should certainly be put to him. Nothing we didn’t already know about this man. What beggars believe, SF is looking for all the parties to embrace the Haas proposals in their entirety but, as above post highlights, when the leaders of SF try to rewrite their own history how can we trust them to act in good faith with the Haas objectives. Another example, Smithwick’s tribunal; conditions and accommodation were met to allow the IRA members who committed the murder of the two police inspectors, needless to say eye witness account defer from the statements of the IRA men’s version of events. i.e. eyewitnesses said they saw a policeman getting out of the car when it had finished up in the ditch, as he staggered towards the gunmen waving a white handkerchief a gunman went up and shot him point blank in the head. Furthermore, we all voted for the GFA, even if some aspects of it was a bitter pill to swallow… for the sake of peace. Now we find there were secret deals done with SF in regard with the OTR’s ! The general public where all hoodwinked into believing everything in the published agreement was what we where voting on. SF’s bywords seems so hollow now, when they go on about transparency. The point I’m trying to make, one quality all participants need to make Haas work is Trust and I’m afraid SF shows no sign of that quality. I would just like to make it clear before any SF apologists reply when there is criticism towards them. I am not anti peace process but just after the truth. Let us see what the SF leaders are made of, and lead by being truthful. That is all the ordinary citizens of this country want, who lived and experienced some of the worst atrocities throughout the troubles, but decided to endure rather than take part in the lawlessness that plagued our country. A veteran republican has revealed how the IRA in Derry were told to stop burying the bodies of executed informers in bogs. Mickey Donnelly, a very senior republican in Derry in the 1970s and former close associate of Martin McGuinness, says the order came from senior Derry republican activists who were interned in Long Kesh. As a result, Mr Donnelly says, a body had to be dug up from a bog. The bizarre incident came after father-of-seven Patrick Duffy, who the IRA accused of being an informer, was ‘disappeared’ in August 1973. Mr Duffy, 37, from the Creggan, was abducted after visiting a pub in Buncrana, Co Donegal, to celebrate his wedding anniversary with his wife Margaret. He was murdered and secretly buried in an unmarked grave in a bog in Co Donegal. His body was sprinkled with line to speed up his decomposition. Mr Donnelly claimed Mr Duffy’s body was returned to his family only after a group of Derry internees smuggled a message out to Mr McGuinness from Long Kesh, expressing their disgust. Mr McGuinness was OC of the Derry Brigade at the time and would have been the senior man for internees to contact about the disappearance. Sixteen days after he went missing, Mr Duffy’s body was left in a new coffin in a car abandoned on the Northern side of the Derry-Donegal border. His body was full of bog water and had been sprinkled with lime. The stand by Derry republicans meant ‘disappearing’ never took hold there – even thought it was widely used by the Belfast IRA who had already disappeared five people, including widowed mother-of-10 Jean McConville. Mr Donnelly said: “We were appalled at the attempt to secretly bury someone. In the IRA, being an informer carries the penalty of execution. That’s the unfortunate reality. As the arrest of Gerry Adams proved it is unwise of those within the republican movement to share details of their involvement in the insurgency – whether those details are shared via an academic Project or otherwise. Having long thought that Adams’s position of denying IRA membership was plain silly – his recent arrest shows that on balance it was probably a sensible one although it undoubtedly – at least partially – undermines his credibility.